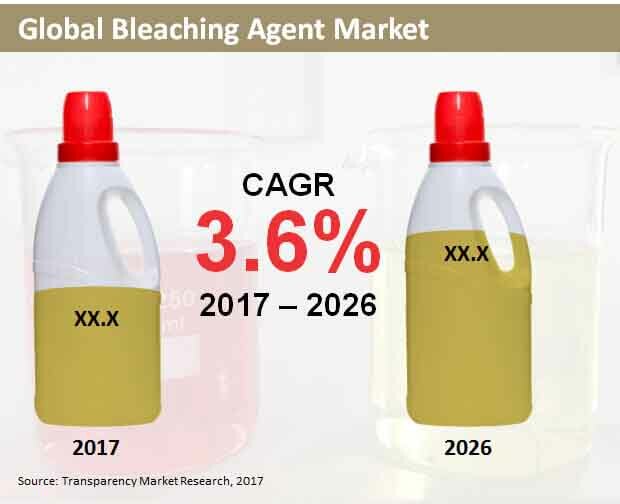 The global bleaching agent market is likely to foresee a surge in its demand due its huge application in various products reports Transparency Market Research (TMR) in a report. In a highly competitive market, the top four of the global players, Solvay, BASF, Evonik industries, PeroxyChem, and AkzoNobel accounts for more than half of the global market share. Companies in the market are investing on research and innovation in order to formulate their brand name and have a product differentiation. Global players are trying to go into a strategic partnership with regional players in order to expand their regional footprint in various local regions. Some of the other leading players in the market are Ashland, Arkema, Spartan Chemical Company, S.C.Johnson & Son, and Colgate-Palmolive Company. TMR anticipates the global bleaching agent market to expand at CAGR of 3.6% during the forecast period 2017-2026. During the assessed period the market is anticipated to bring in 1232016 tonnes. On the basis of application, the pulp and paper segment holds a massive share. Pulp and paper is estimated to create a lucrative opportunity of more than 10900 tonnes during the forecast period. However, chlorine which is used as a bleaching agent in paper and pulp industry is known to be under strict focus for safety concerns. Geographically, Asia Pacific Excluding Japan (APEJ) is predicted to account for the highest share in terms of revenue during the forecast period. Rise in industries such as pulp and paper, house hold cleaner, and textile is anticipated to bolster the growth of the market. Regarding management of wastewater is promoting the growth of the bleaching agent. Chlorine-free or green bleach bleaching agent is attracting a lot of industry particularly textile industry. This has led to the excessive use of hydrogen peroxide as it is known to leave to chemical residue on the material. Hydrogen peroxide has gained immense popularity due to its environmentally friendly nature, this has attracted a lot of environmental concerned population, thus fueling the growth of the market. However, bleaching agents are known to have a negative impact on the health as it is known to damage eyes, lungs, skin, etc. Strict government regulations regarding to the use of bleaching agent in various countries is anticipated to deter the growth of the market. Although with the advent of oxidizing bleaching agents in the pulp industry is likely to boost the growth of the market. Various manufacturers are focusing on the chemical bleaching in order to produce a bleaching agent which can emit less contaminants into water, soil, and air, thus burgeoning the growth of market.